JNKPlat 07 is a puzzler by Jayenkai disguised as a platformer, in which all movements are measured in grids. 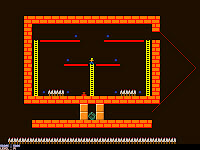 The problem of missing a leap by mere pixels is avoided, though two jump buttons have been included so there could be a slight confusion when learning the controls. Each of the twenty stages can be completed without collecting all bonus items.